A series of images indicates the paths of the two asteroids orbiting Sylvia. An asteroid known to astronomers for more than a century has now been found to harbor two small satellites. It is the first asteroid trio ever discovered. And there may be more than three. The main asteroid, named 87 Sylvia, is one of the largest known to orbit the Sun in the main asteroid belt, between Mars and Jupiter. It is potato-shaped, about 175 miles (280 kilometers) in diameter and 235 miles (380 kilometers) long. It was discovered in 1866. The first moon was found four years ago and the second one was announced today. There are about 60 asteroids known to each have one companion. The first pair was noted in 1993, when the Galileo spacecraft spotted the moonlet Dactyl orbiting asteroid Ida. Some pairs involve a smaller satellite, while in others the two objects are roughly equal in size. Asteroid 87 Sylvia was named for Rhea Sylvia, the mythical mother of the founders of Rome. Now its moons will be called Romulus and Remus, for the ancient city's founders. Romulus is some 11.3 miles (18 kilometers) across and orbits the main asteroid every 87.6 hours. Remus, the newfound object, is about 4.4 miles (7 kilometers) wide and orbits Sylvia every 33 hours. Sylvia completes one rotation about its axis -- a day -- every 5 hours and 11 minutes. The three-rock setup was likely created in a collision, astronomers said. "People have been looking for multiple asteroid systems for a long time, because binary asteroid systems in the main belt seem to be common and formation scenarios, such as a collision between two asteroids followed by disruption and re-accretion, suggest that fragments should be orbiting bigger asteroids," said Franck Marchis, a researcher at the University of California, Berkeley who led the discovery. The details are reported in the Aug. 11 issue of the journal Nature. 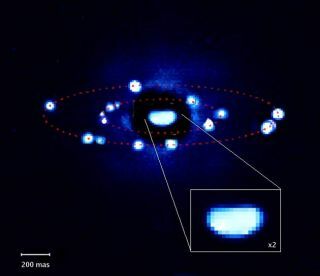 There may be smaller moons around Sylvia that still evade detection, Marchis told SPACE.com. Satellites up to 3 miles (5 kilometers) wide could lurk between the two known moons, he said, and an even larger object could exist inside the orbit of Remus and escape detection. Observations of Sylvia itself support the idea of a collision. The asteroid's low density and known size allowed astronomers to calculate that it must be a rubble pile, rather than a solid rock. "It could be up to 60 percent empty space," said French researcher Daniel Hestroffer, a co-author of the study from the Observatoire de Paris. The small satellites are thought to be collision debris that went into orbit rather than getting re-stuck to Sylvia. Based on what they've seen so far, astronomers estimate that about 6 percent of asteroids have companions, Marchis said, adding that it is too early to guess how many systems might contain multiple rocks. The discovery was made with a European Southern Observatory telescope in Chile.